If you are wondering what a milk frother is, it is basically exactly what it sounds like. It is a tool that is used to make milk foamy and frothy. People would want to use one of these in order to make a coffee beverage the way that it is made at a coffee shop. These beverages are made by aerating warm milk and then blending it with the coffee. There are many different types of milk frothers from which you can choose. Though all milk frothers basically do the same thing (aerating milk by quickly stirring it up to bring as much air into the mixture as possible). This is how bubbles in milk in these coffeehouse beverages are created. The frothers give the liquid a light texture and give it a lot more volume as well. The foamy mixture that comes from this process is effective in making the sharp flavor of the coffee in the beverage a lot less strong and dominant. This can make cappuccinos and other popular coffee-based beverage a lot more mild and better for drinking for those who do not like the taste of strong coffee. 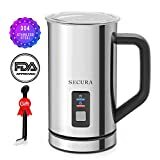 However, even though all of these frothers perform the same function, you can have your choice of the specific type of frother that you would like to purchase. 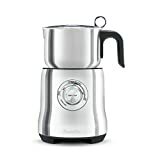 Frothers on Cappuccino Makers: Many cappuccino machines include steam-operate milk frothers. If you plan to use your cappuccino maker to make all of your coffee-based beverages that include milk, this may be the simplest option for you. These milk frothers create a stream of hot air that stirs up the milk. This is what is responsible for the hissing sound that you have likely heard in coffee shops and from cappuccino makers elsewhere. Hand Pump Milk Frothers: These milk frothers consist of of fine mesh screens attached to plungers. Typically, these come in stainless steel cups. Even though these usually take more manual effort on the owner’s part when actually frothing the milk, they are relatively simple to figure out and use. It is fairly easy to make a small amount of foam, so these milk frothers are adequate for those who only want to use them to make one or two cups of their desired beverage at a time. These are affordable, relatively more so than most other types of milk frothers. Automatic Electric Milk Frothers: These frothers are typically small and self-contained. They also commonly look like cups or small food processors. 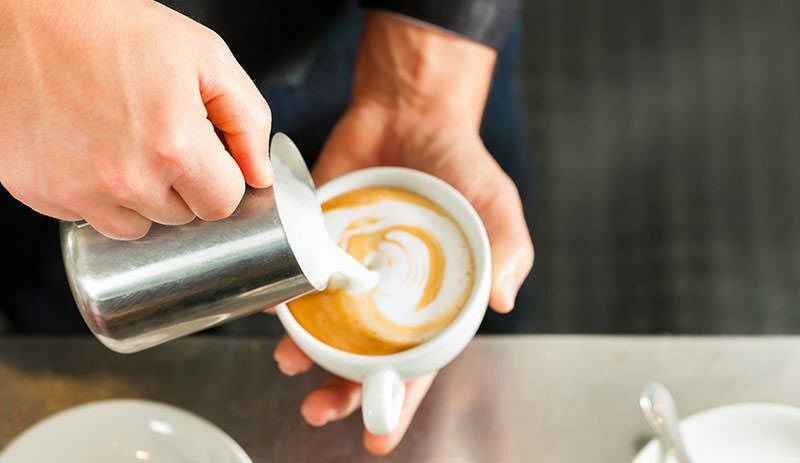 They can be a better option for the people who want to make multiple coffee beverages at once, as they typically produce a lot more foamy milk than the hand pump. However, you should keep in mind that it is also usually more expensive than the ones that require more manual effort as well. These work quickly and some of them warm the milk while stirring it up as well. 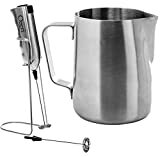 Handheld Electric Milk Frothers: There are propeller and whisk models of these frothers as well; these perform the desired task in the same way as other types of frothers. They are hand-held electronic devices that involve a small propeller or whisk that is located on the end of the milk frother. When the device is switched on, the propeller or whisk will start to rapidly spin in order to froth the milk. These devices are a little bit more pricey than the hand-held versions, but they are, like the electric milk frothers, more efficient in terms of making larger batches of your desired drink and can create the desired foam more quickly. However, you should keep in mind that these devices can easily chip at or scratch the insides of porcelain cups while frothing the milk. If you are trying to decide which milk frother you want to buy, you have a lot of options. You can choose from all of the different types that have been described. It is important, first of all, to pick the product that would work the best with your purposes, rather than simply basing your decision on ratings and reviews that you see online or in catalogs. However, there are a few other tips that can help you in your purchase decision as well. First of all, focus on quality rather than price. Just because a product is cheap does not mean it will be a good investment. If it is cheap and low in quality, you could end up losing more money having to replace it than if you had chosen a higher quality and more expensive product to begin with. Also, think about the cleaning method for the product in which you are interested. You will want it to be easy to clean, so that it does not carry much of a risk of contamination with microorganisms when you store it. You can choose to have a frother with only one temperature setting or all temperature settings (cold, warm, and hot). This is dependent on what kinds of beverages you intend to make with this tool. Also keep in mind how many people are going to be using this tool every day. If there are multiple people using it, you may want to choose a larger capacity frother, for example. If you want to make sure that your milk frother will last for a long time, choose the one that is the most non-corrosive and durable. Typically, aluminum or stainless steel frothers will be the best options in this regard. 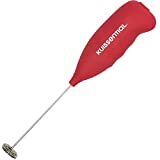 If you go out of town a lot and would like a frother that you can take with you, you can take this into account and choose one that is small and portable. 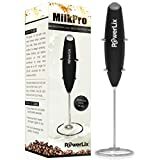 You also may want to choose a frother that comes with the automatic feature, which allows the tool to shut down automatically when it gets to the target temperature. If you are someone who is often absent-minded or is going to be doing a lot of other things while preparing your beverage, you may want to choose one that has this feature. How you will be using your milk frother, once you buy it, will depend on the type of frother that it is. Using the Hand Pump Milk Frothers: Start off by heating up some milk, so that it is warm rather than boiling. If it is too hot, this will ruin your foam. Fill up your carafe between 1/3 and 1/2. Start pumping as quickly as you can, and you should have frothy milk within about 30 to 60 seconds. Pour this milk into your coffee, and enjoy your drink. Using the Automatic Electric Milk Frothers: This is probably the easiest one to use. Fill the carafe in the frother with milk, between the 1/3 and 1/2 levels. Turn on the machine; the majority of these milk frothers will offer the option of letting you froth the milk without heating it up first. If you prefer to do this, you can. Once it is turned on, it will froth the milk on its own, so you can just wait for about 90 seconds while it does its job. Once the machine is done, you can just open the carafe and then pour the foamy milk into the cup of coffee you are planning to drink. Now, you are done, and you can enjoy your drink. Using the Handheld Electric Milk Frothers: These take more effort than the automatic electric milk frothers but considerably less effort than the hand pump variety. Start by heating your milk to a warm temperature (again, not boiling). Fill the container up between 1/3 and 1/2. Turn on your frother, and dip the propeller or whisk into the milk. Pump the liquid up and down, stirring occasionally as the machine is doing its work. While you are stirring, bring the whisk to the surface a few times, because you do want to get some air into the mixture. Within about 15 to 30 seconds, you should have some nice foam. If you are using a cup, you can pour some coffee in; if you are using a frothing pitcher, pour the foam into a cup of coffee. Stir it up however you would like, and then enjoy your drink. How you will need to care for your milk frother will depend on the type it is. Regardless of the type, you will want to clean it immediately after it is used, in order to minimize the risk of bacteria buildup. If it comes with multiple components, clean them separately. Try to hand wash them rather than letting them be cleaned in the dishwasher, as the dishwasher may damage them over time. If there are any electrical parts, such as motors, make sure that these are never submerged in water. Do not put the power cord in water either, as this can cause electric shocks if it is still wet when you plug it in.